Guitar manufacturers; we have served as a design and historical consultant to many major manufacturers for their re-issue series and current models. We also offer technical, historical and photographic documentary assistance to guitar related books, magazine articles and the film industry. Please contact us with a specific requirement. You've seen them, you've played them, you love them - the Danelectro re-issues! Well, thank Steve Soest for them. From counting the pickup winds, magnet material, accuracy of the components, to making sure the high quality masonite emulates the originals, Steve has re-engineered the Danos to be just as cool, and to have the same vibe as the originals. Soest serves as an ongoing historian, technical consultant, and designer as well as creating prototypes for many of the new models. 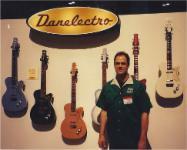 Danelectro is just one of the many companies, books, magazines and other publications that Steve has been a contributor or consultant to.